You will be given a reference e-book to read which has 265 pages And the test will be based on that e-book , you can take the test after 10 days Of purchase. A course to learn all about Six Sigma- enabled marketing. It is not a course about just marketing techniques, and those of you holding master’s degree in marketing also have a lot to learn from this course as it is about Six Sigma for the marketing professionals. "This course throws light on the unexplored areas of six sigma enabled marketing that focuses on growth and gives solutions for problems by designing and structuring the tasks within the marketing process through Six Sigma." If your company is getting ready to adapt to 'Six Sigma Level,' this is the course that you need to take if you are a marketing executive in the company. Unlike the boringly long books that go on and on about the same subject in different ways,' this course is comparatively short. A course based on the three process areas in marketing that are responsible for sustainable growth which are Strategic marketing Process, Tactical marketing Process, and Operational marketing process. "It gives a complete guide on how to use the right tools and methods to complete the marketing tasks by structuring a lean workflow." This course is laid out in 8 specifically categorized chapters. The first chapter 'Introduction to Six Sigma for Marketing processes' gives you the basics of how six sigma integrated into marketing processes. It gives you a picture how the three methods of marketing work together to contribute to the growth of the business. Chapter 2 is 'Measuring Marketing Performance and Risk Accrual using Scorecards' that introduces the scorecards that measure things such as risk accrual from tool use, task completion, gate deliverables, etc. for the three marketing processes mentioned in the previous chapter. Chapter 3, 'Six Sigma-Enabled Project Management in Marketing Processes' let you discover from the view of project management, how six sigma tools can help design and manage their work in the marketing department. Chapters 4, 5 and six under the headings 'Six Sigma in the Strategic Marketing Process', 'Six Sigma in the Tactical Marketing Process' and 'Six Sigma in the Operational Marketing Process' gives detailed descriptions of each marketing process. These chapters lay out in detail enabling tools, methods, best practices, gate requirements and gate deliverables, etc. all of which help complete critical tasks within the marketing processes. Chapter 7 with the title 'Quick Review of Traditional DMAC' gives an overview of the essential classic six sigma problem-solving approach known as Define-Measure-Analyse-Improve-Control. The final Chapter titled 'Future Trends in Six Sigma and Marketing Processes' concludes the course is giving few tips for the success of any organization. This course is structured in a way to give out the relevant information with enough details to get the point but not too much explanation to make it annoying. "We understand that marketing professionals do not have too much free time on hand to go for an elaborate course that goes on and on about different processes." This course is what you need to succeed in your profession, and it gives enough details about the different processes, tools and methodologies followed in Six Sigma enabled marketing. This course is intended for anyone who is working in marketing or for those who are responsible for overall functioning of a company or organization. Marketing executives, managers and leaders can definitely benefit from this course. Anyone interested in learning about Six Sigma methods, tools and best practices can find this course very useful. "Marketing is an important aspect of any organization and any new organization will benefit hugely if the executives in the marketing department have undergone this course." This course is intended to bring the marketing professionals into the same six sigma paradigm workflow that exists in the technology and engineering sector. For any organization to function efficiently, it is essential that all the departments are organized and efficient that they collectively contribute to the success of the group. While the standard courses usually target other departments in an organization, this course is unique for the marketing executives to achieve the same level of efficiency and success made by other units. One can see a tremendous improvement in your marketing capability after completing this course. Six Sigma has become a global trend now, and every small and large organization is giving first preference for people who hold Six Sigma Certification. Six Sigma Marketing executive certification will make learn how to take over the responsibility of the overall functioning of the organization. Managers and Marketing Executives can surely benefit from the course. Getting a Marketing executive Six Sigma job is going to be immensely accessible in the upcoming years. With this Six Sigma Marketing Executives certification, you can get job from all over the world as you have already acquired the needed skills and recognized knowledge through this certification. This certification enriches not only your knowledge but also your profile. 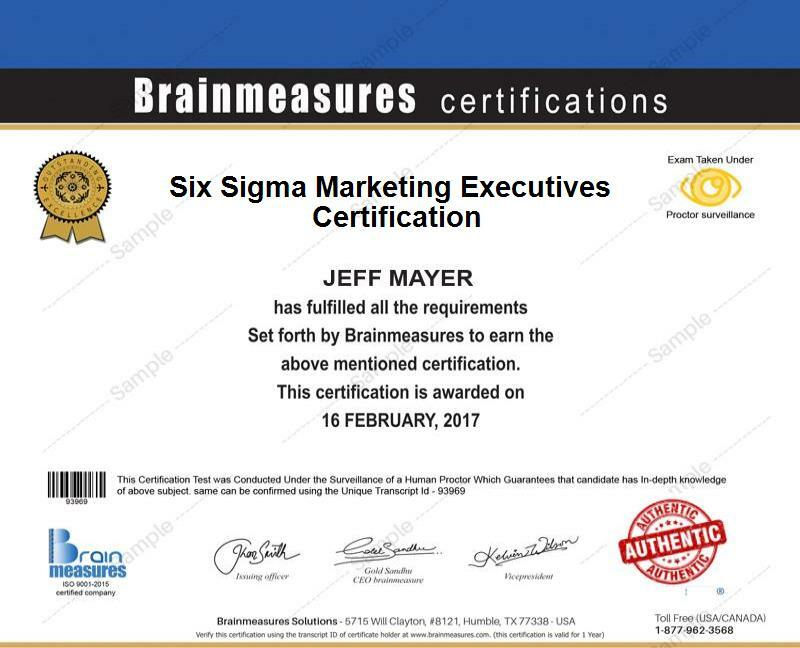 The demand for the Six Sigma Marketing Executives has become more these days, and just a few hold this certification so far. Make sure you complete this certification as soon as possible and see how your life turns. According to the recent statistics, the six sigma marketing executive salary range is between $55,000 to $72,000. The average income level of the six sigma marketing executive in the United States is around $60,000.